The “Headless CMS” is a relatively new type of tool, but what is it? What makes it different? And, how do you get started with one? Traditional CMSs typically have two major components: a back end where you create and manage your content, and a front end which displays the content. The front end is almost always a website which is often built using outdated techniques, tools, and libraries. 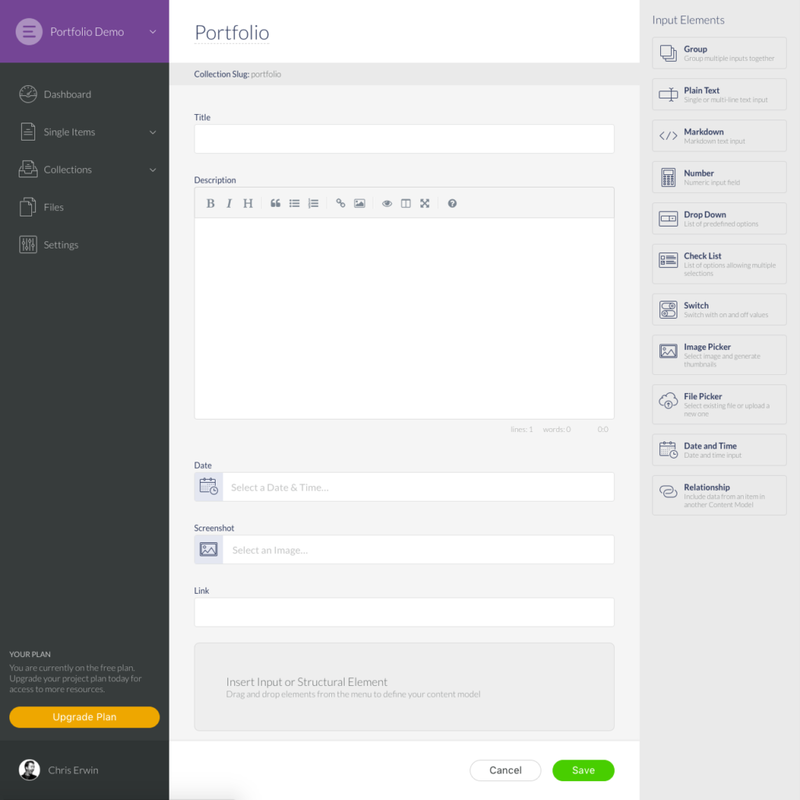 Headless CMSs take a different approach, only having a back end where you create and manage your content. They typically deliver your content via a robust API which allows you to easily retrieve your content in a developer-friendly way. This separation of concerns means the CMS does only one thing: manage your content. Headless CMSs don’t dictate how or where you display your content. You can deliver your content to any device or platform, using practically any programming language, framework or library. And check out SitePoint Premium for more books, courses and free screencasts. Let’s take a look at how we would build a simple portfolio site using Elemeno, a popular Headless CMS cofounded by yours truly. We’ll use a typical Node.js development stack, but the same principles could be applied to any language or framework. We’ll get started first by setting up our project on Elemeno. Elemeno is a hosted product, so there’s nothing to install and no databases to set up. Simply create an account, if you don’t already have one, then create a new project. You can get started 100% free by choosing the development plan, which will fit our needs perfectly for this demo. The next step is to define our content models. You can think of a content model as the template of inputs that will be displayed when creating content. Elemeno has two different types of content models: Singles and Collections. Collections allow you to create many items from the same content model. This is perfect for things like collections of products, articles, or projects. Singles allow you to create a single item from a content model. This is ideal for things like contact info, or about us pages. When creating a collection on Elemeno, you start by giving your collection a name at the very top of the screen. We’ll call our collection “Portfolio”. You’ll see that our collection starts with a single “title” input on the left side of the screen, and a list of input elements on the right. To define our content model we simply drag and drop input elements from the list onto our blank slate on the left. These inputs are exactly what you’ll see when creating the content items for your portfolio. After placing each input element, click on the input to change its settings. We’ll set the “label” for each input and leave the other options to their default setting for now. Once we’re happy with what we have, we can click the “Save” button to create the collection. Now that we have our Portfolio collection defined, we can start creating items. Simply click the “Create the first item” button to get started. Fill out each of the inputs and click the “Save and Publish Now” button to create our Portfolio item. Next, create a few more items to fill up our Portfolio Collection a little bit. You should see your installed version show up, or command not found: node if Node isn’t installed. If you need to install Node, simply download the installer from the Node.js website. Now we need to create a new directory called views to hold all of our Pug template files. Then we’ll configure Express to tell it where our templates live, and which templating engine we’re using. Note: you can use any other supported templating engine based on personal preference. This simply tells Express when someone makes a GET request to our root / we want to render our index.pug template. From a Terminal window you can now type node server and hit enter to get our website up and running. Voila! We have a super basic node website. In your web browser go to localhost:3000 and you should see our super awesome “Hello World!” message. Now let’s include the content from Elemeno in our website. We’ll start by creating an API Key which will allow us to access the content from our portfolio website. Go to the Settings screen on Elemeno, find the API Keys section and click the “Create API Key” button. We’ll give our key a name of “Website” and we’ll leave the other settings to their defaults. We’ll see our new API Key listed, click on it to view the details and copy the “Access Token” value. We pass the slug for our Portfolio collection, portfolio, to the getCollectionItems function. This function will return an array of objects representing the items in our collection. We then render our Pug template and pass along the data that was returned. Our next step is to implement that data in our Pug template. Open the index.pug template and create a simple for in loop to display a list of our projects. "html": "<p>The best little search engine that ever existed</p>"
We can restart our server by going back to our Terminal window where our Node server is running and hitting Control + C on our keyboard. This will stop our node server. We can start the server again by typing node server and hitting enter. Note how we’re including the project.slug in the URL for the details page. This will allow us to determine which portfolio item to fetch on the details page. Here you can see that we define our route path with a dynamic parameter :slug. This means that if we make a GET requests to /views/ANYTHING it will get handled by this route. We extract the slug param from the URL and set to a new variable slug which we then pass to our getCollectionItem function. Note this function is fetching a singular item from the collection, so we need to pass both the collection slug and the item slug. This function returns a single object representing the item that we requested. We render our details.pug template and pass along the data for our portfolio item. We can now restart our server again, and we’ll have a home page that links to our details page and all of the content will be pulled from Elemeno. If we create a new portfolio item on Elemeno, and then refresh our portfolio’s home page, we’ll see the new project listed there as well. We can restart our server again, and if we try access a non-existent project we should get our new 404 page. That’s it! We have a simple website pulling content from a Headless CMS. Our website is incredibly crude, and leaves much to be desired in terms of design and user experience. However, you can see how easy it is to access content from a Headless CMS like Elemeno and use virtually any programming language, templating engine, or framework. We could have easily used a different templating engine like EJS, Dust, or Handlebars. Instead of Express we could have used a different framework like Koa, Hapi, or Sails. Instead of Node we could have used a different programming language altogether like Ruby, PHP, or Python. Instead of a website we could have built a Mobile App, Watch App, or some sort of Arduino prototype. A Headless CMS allows you to easily manage your content while allowing you to build projects on multiple devices using your favorite tools and techniques. Your CMS should not dictate where or how you build your projects. I’ve shared a fully baked version of this simple portfolio site on GitHub: Elemeno Portfolio Demo. Feel free to fork it and make it your own! Chris is cofounder of Elemeno, a headless, API-first CMS. Previously he was lead developer for the world renowned design agency Teehan+Lax where he worked on high profile projects for Medium, YouTube, Google, Flipboard, and many others. He’s passionate about creating beautifully crafted experiences that solve complex problems in simple ways.